We are now in one of the tunnels of the Al-Quds Brigades, on which work began as soon as the war on Gaza ended and the ceasefire was declared. We have begun work and we are continuing it regardless of the threats by the Zionist enemy. We will not be hindered by the threats of the enemy, or by the ban on importing cement and other building materials. A housing assessment by Shelter Cluster, chaired by the Norwegian Refugee Council with the participation of the U.N. refugee agency and the Red Cross, says Gaza will take 20 years to rebuild. Most rebuilding is due to the housing deficit of 75,000 units. Cost estimates for the restructuring are more than $6 billion. The housing assessment derives from the present level of goods transferable from Israel to Gaza. The present blockade hinders rebuilding efforts, as construction materials have restrictions to limit tunnel production. The 20 year timeframe takes into consideration 100 truckloads of building materials on a daily basis. Currently there is no mention of plans to ease blockade restrictions. It was possible for us to avoid all of that, 2,000 martyrs, 10,000 injured, 50,000 houses (destroyed). They (Hamas) have a shadow government, if this continues it means no unity. The test is coming soon. The government needs to do its job and handle everything. I’m not saying everything needs to come to an end in one moment, this is a seven-year split that needs months or years. The Egyptian formula was on the table on July 15th, it was backed by the Arab League, it was accepted by Israel but rejected by Hamas then and now more than a month later has belatedly been accepted by Hamas. As the dust clears from the conflict I’m sure many people in Gaza will be asking why did Hamas reject a month ago what it accepted today, and if it had accepted then what it accepted now, how much bloodshed could have been avoided. 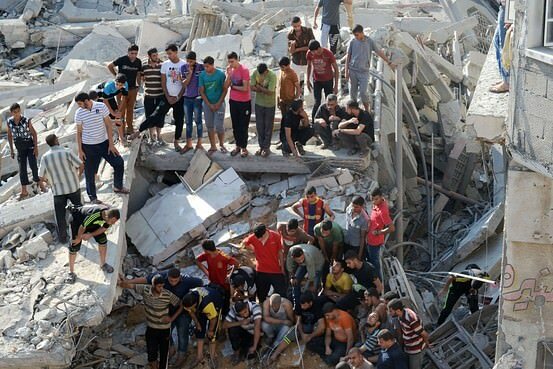 More than 2,100 people are reported to have been killed in Gaza, most of them civilians, including about 500 children. At least 11,000 people have been injured and more than 17,000 homes destroyed or badly damaged, while around a third of the territory’s 1.8 million residents have been displaced. On the Israeli side, 64 soldiers have died along with six civilians, including a four-year-old boy, and hundreds of families have relocated from homes near the Gaza border. We don’t glorify these killers. We put – we apprehended him in three – three days after the – that tragic killing, immediately put them in custody. We’re putting them on trial. They will serve a good chunk of their lives in jail. That’s what we do with the killers. We don’t name public squares after them. We don’t glorify them. We don’t educate our people, our children in suicide kindergarten camps, as happens in the Palestinian side. And you should see what Hamas is educating them to, no peace, no two-state solution, nothing, just jihad, more and more violence, more and more murder, and more and more bloodshed. This is not our way. We have – I think a society is tested not by the extreme fringes of that society, but how it takes care of them. We take care of those extreme fringes. We basically isolate them and ostracize them and punish them. The number of Palestinian deaths rises to 1,903 as five people are killed in fresh airstrikes after the 72-hour truce window ends. Israel says 65 rockets have been launched from the Gaza strip by Palestinian factions, and it has responded with 63 strikes. Three people were killed in an attack on a mosque in the Nusseirat refugee camp and two when a motorcycle was hit in the Maghazi refugee camp, Gaza’s Health Ministry says. Israeli officials leave Cairo after negotiations to extend the ceasefire break down, while the Palestinian delegates remain and say they are willing to commit to new talks on a truce. We were in the school on the first day of the ceasefire and came back this morning. There were strikes and shelling in the last hour or so. It’s not safe, so we have to come to the school however bad it is. We will stay now until the war stops. Hamas is calling for a variety of conditions including an airport and sea port in the Gaza Strip but is primarily concerned with opening border crossings. Israel wants demilitarization of the Strip and disarmament of Hamas. All the Palestinian factions, including Hamas, have agreed not to renew the ceasefire because [Israel] is refusing to accommodate our demands. The Al-Qassam Brigades and Jerusalem battalions will renew its attacks immediately with the end of the ceasefire period on Friday at 8 a.m. Editors at Haaretz find that the newspaper’s Hebrew edition has several thousand readers in Egypt, presumably Egyptian intelligence operatives trained in Hebrew, while the newspaper is found to be the most cited and most trusted media source by both Palestinian and Israeli supporters. 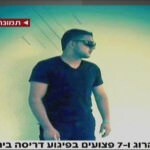 The alleged ringleader of the 2014 Israel kidnappings has told police that he received money for the attack from Hamas operatives in the Gaza Strip, state prosecution says after a gag order on his arrest and investigation is lifted. 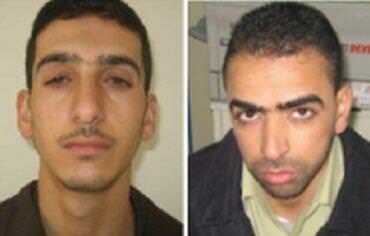 Hebron resident Hussam Kawasme states that alleged killers Marwan Kawasme – his brother, who was released in 2011 in an prisoner exchange for Israel Defense Forces soldier Gilad Shalit – and Amer Abu Aysha drove to his house after abducting and killing Yeshiva students Gil-ad Shaar and Naftali Fraenkel, both 16 years old, and Eyal Yifrach, 19. The three then drove to a plot of land in Halhoul purchased by Hussam Kawasme ahead of time, where they buried the bodies of the teenagers. We are concerned. We have communicated with the ITF, which promises to make a decision about Davis Cup very soon. 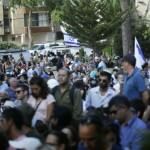 Israel has expressed its readiness to extend the truce under its current terms. Gaza residents are reported to attack and beat Hamas spokesman Sami Abu Zuhri near the Shifa hospital due to anger at Hamas’ perceived role in causing the 2014 Gaza conflict. The Arabic-language report from Egypt’s Veto Edge quotes spokesperson for the Sisi Supporters Front, Mohamed Abu Hamed, as saying that Gaza is ripe for a revolution to overthrow Hamas, while Nabil Zaki, a spokesperson for the left-wing Tagamoa Party in Egypt, says that Palestinians are partly responsible for their plight as they voted Hamas into power, and that anger from civilians would bring few results without expanding into a revolution. At least 1,867 Palestinians have died in the 29 days of the 2014 Gaza conflict prior to the latest ceasefire and peace talks getting underway. In Israel, 64 soldiers and three civilians are dead. 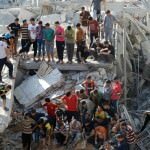 The United Nations and Gaza human rights groups say that at least 75% of the Palestinians killed are civilians, however Israel Defense Forces spokesman Lt. Col. Peter Lerner says that about 900 were militants, while the IDF separately estimates that between 750 and 1,000 of the Palestinian dead were combatants. This suggests that Americans may have responded to both crises in ways that reflect their basic attitudes toward Israel and the Palestinians rather than the specifics of either conflict. In general, Americans rate Israel much more favorably as a country than the Palestinian Territories, and are much more likely to say they sympathize with the Israelis than the Palestinians when asked to choose between the two sides. it is important to note that the pro-Israel sentiment on this measure is significantly below the percentage who routinely say that their sympathies are more broadly with the Israelis rather than the Palestinians in the Middle East. Prior to the operation, the IDF estimated the Gaza rocket arsenal at approximately 10,000, one-third of which were fired at Israel, and an additional one-third was demolished by the IDF. The IDF says that of 3,365 rockets fired by Hamas in the 29 days of the 2014 Gaza conflict prior to the 72-hour ceasefire, 597 were launched from civilian facilities, approximately 260 were launched from schools, 127 from cemeteries, 160 from religious sites such as mosques, and 50 from hospitals. Just under 70% were fired from the northern Gaza Strip, 12.9% were fired from the central Gaza Strip, and 17.3% were fired from its southern region. The IDF says it has struck around 4,762 targets in the 29 days of Operation Protective Edge prior to the 72-hour ceasefire, most of them rocket-launching sites, nearly 1,000 of them command and control centers, about 240 Izz ad-Din al-Qassam Brigades buildings, nearly 200 weapons storage and manufacturing facilities, nearly 150 terror training compounds and 1,535 additional sites. …averted a much more serious incident. A truce is a truce, but the presence of the Israeli forces inside Gaza and destroying the tunnels means it’s an aggression. We did not deceive Mr. John Kerry, and we did not deceive the Israelis, we fight honorably. We told everyone that this is our position. … Therefore they are the ones who should be responsible for this. In life, you can choose to do things for yourself and you can choose to do great things. I’m extremely concerned about these reports and we are doing everything we can to get to the bottom (of them) and find out exactly what has happened. I don’t want to say anything before we’ve been able to do that but this only reinforces the need for an immediate unconditional humanitarian ceasefire observed properly by both sides. This slaughter, this killing has got to end. 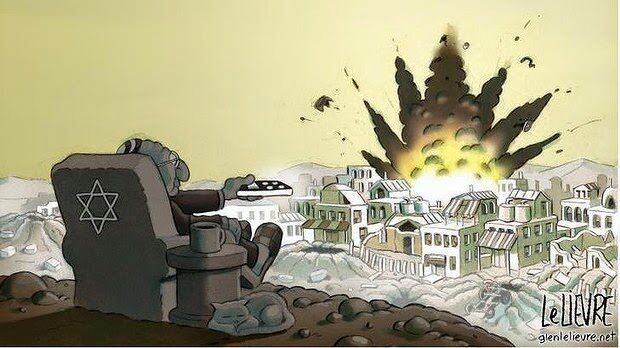 The Executive Council of Australian Jewry and the NSW Jewish Board of Deputies say the editorial ‘unreservedly apologising for the publication of an antisemitic cartoon’ means the matter is now closed. The United States is appalled. 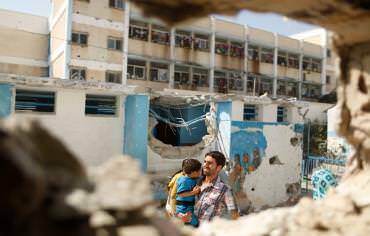 The coordinates of the school, like all UN facilities in Gaza, have been repeatedly communicated to the Israeli Defense Forces […] Israel must do more to meet its own standards and avoid civilian casualties. The suspicion that militants are operating nearby does not justify strikes that put at risk the lives of so many innocent civilians. You who came en masse, live righteously and don’t hate one another. Hadar wanted to be a Jewish fighter. Do the same as he did. Take the bible with you and become Jewish fighters. I thank the crowds who came from far and wide to be with my family. A video by France24 appears to confirm that Hamas is launching rockets from the Shifa hospital. The video uploaded to Youtube by the news channel’s Arabic service shows a correspondent reporting from the hospital, when a rocket is launched next to her at the end of her report. If we feel that deterrence has been achieved we’ll leave the Strip based on the principle of calm for calm. If we feel deterrence has not yet been achieved, we’ll continue the operation in the Gaza Strip, or leave and press on with aerial strikes. You have forgotten how this war started. 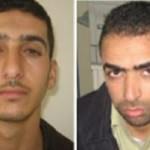 Did Hamas not kidnap and kill three young teenagers for the sake of killing, and celebrated after the killing? What a travesty of justice. I am asking all my peers who signed that poison letter against Israel to examine their motives. Can you take back the fire of anti-Semitism that is raging all over the world now? They are obviously ignorant of the whole story of Israel’s birth, when in 1948 the Jewish people were offered by the UN a portion of the land originally set aside for them in 1921, and the Arab Palestinians were offered the other half. The Arabs rejected the offer, and the Jews accepted, only to be attacked by five surrounding Arab countries committed to driving them into the sea. But the Israelis won. The Arabs tried it again in 1967, and again in 1973, launching a sneak attack on the holiest Jewish holiday. Each time the Jews prevailed but not without great loss of life. And when Israel was not fighting a major war, it was defending itself against terrorist campaigns. And yet Israel has always labored for a peaceful relation with its Arab neighbors. It voluntarily returned the Sinai Peninsula to Egypt in return for peace, and gave the Palestinians all of Gaza as a peace gesture. What was the response? The Palestinians elected Hamas, a terrorist organization, and they immediately began firing thousands of rockets into Israel. 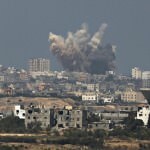 Hamas says Israel mobilized machinery and troops at 06:30 a.m. local time, 90 minutes before the midnight Eastern Standard Time commencement of the 72-hour ceasefire and penetrated up to 1.5 miles into Rafah before destroying homes on the pretext of searching for tunnels, and deploying rooftop snipers. We have lost contact with the group of fighters that took part in the ambush and we believe they were all killed in the (Israeli) bombardment. Assuming that they managed to seize the soldier during combat, we assess that he was also killed in the incident. The IDF’s Hannibal Procedure rule states that no soldier of any rank is to be captured, and includes standing orders to bombard possible escape routes in the event of an abduction. If they are serious about resolving the situation, that soldier needs to be unconditionally released as soon as possible. I think it’s going to be very hard to put a ceasefire back together again if Israel and the international community can’t feel confident that Hamas can follow through on a ceasefire commitment. Gaza officials and Palestinian media say at least 10 people have been killed and 15 wounded around four hours into the 72-hour ceasefire period. Health Ministry official Ashraf al-Kidra and Gaza police spokesman Ayman Batniji say Israeli tanks shelled the eastern part of the town of Rafah in the south of the enclave shortly before 1000 local time, 0200 Eastern Standard Time. 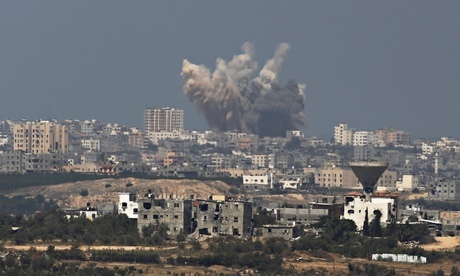 The Israel Defense Forces says a heavy exchange of fire has erupted in the area. The campaign includes full-page ads in The Washington Post, The New York Times, The Wall Street Journal, The Chicago Tribune, The Los Angeles Times, The Miami Herald and use of social media. that’s got to go hand-in-hand with the recognition of Israel’s right to exist behind secure borders. The problem in the Middle East is that in the end so many people are not prepared to accept Israel’s right to exist. The Pentagon confirms that Israel has been allowed to draw tank shells and illumination rounds from a cache of U.S. arms and equipment stored on Israeli soil. Known as the War Reserves Stock Allies-Israel program or WRSA-1, the billion-dollar reserve was established as part of expanded mutual cooperation during the 1980s and can be accessed with U.S. approval, according to a report from the Congressional Research Service the last time Israel was allowed to tap the stockpile was during the 2006 Lebanon war against Hezbollah. 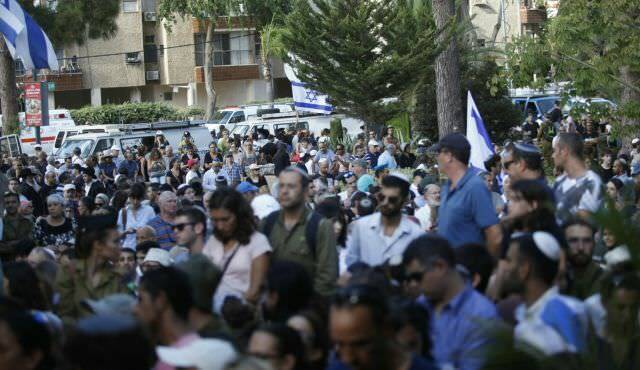 Over the course of the surveys, Israeli Jewish public opinion has been consistently almost unanimous in its definition of Operation Protective Edge as justified – an average of 95% (96%, 92%, and 97% over the course of the three surveys). The Home Front Command is given an average grade of 9.1, 8.6, and 9.1 on a scale of 1-10, with one being very poor and 10 being very good, while the performance of the government was rated as 8.0, 6.3, and 8.0. 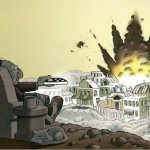 The Israeli enemy struck our house twice.